Phew, the holidays are over. It's amazing how every year it is such a mad rush from October to January. Especially when you have kids. And we aren't big social people, so we don't host any parties. Even with not hosting parties, things are still crazy. We always have plenty of parties through school or day care. And of course getting together with family. As much as I love all the chaos, I do look forward to slow January. There are always plenty of cold-weather activities to keep us occupied! What are everyone's New Year plans? Do you throw a big party and watch the ball drop? Do you go out on the town with friends or family? My goal is to go to bed as early as possible- ha! I guess that's what happens when you are a mother of three small children, baby included. Sleep is my best friend. When I can get it, I take advantage of it! I always enjoy reflecting on past New Year's. So many great times celebrated in different parts of the world! Ah, to be young and carefree. This ice cream is perfection. 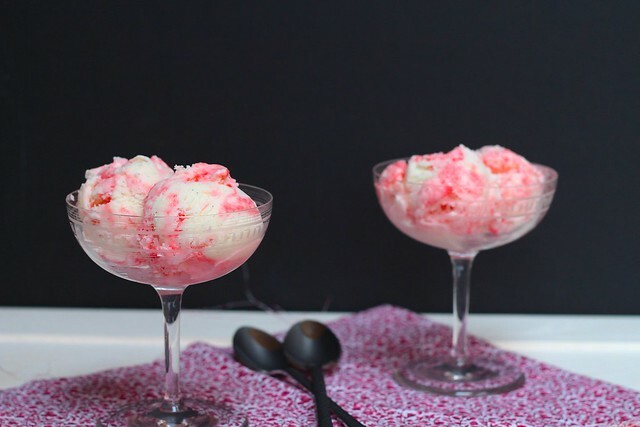 It is rich and creamy vanilla with crushed candy canes swirled in. 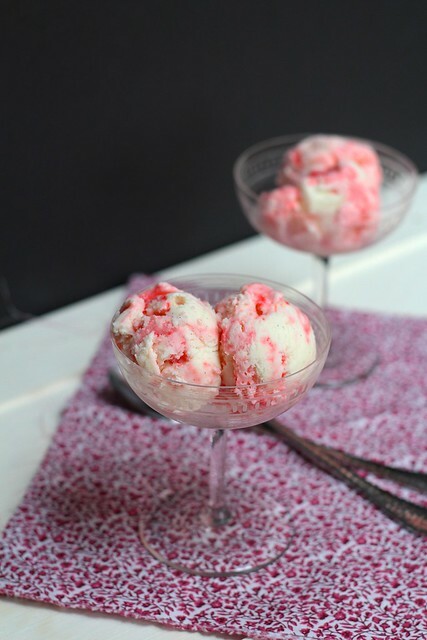 The candy canes melt into the ice cream, making it a beautiful pink and distributing the flavor. I wish I had more candy canes because I would make another batch! This is a great way to use up those candy canes hanging out on your tree. If your tree is still up, that is. This is a wonderful, refreshing dessert that any peppermint lover would enjoy. In a medium saucepan, combine the remaining milk, heavy cream, sugar, corn syrup and peppermint extract. Bring to a rolling boil over medium-high heat, stirring occasionally. Let boil for 4 minutes, stirring occasionally. Remove from the heat and whisk in the cornstarch mixture. Place the saucepan back over the heat and bring to a boil again over medium-high heat. Stir constantly with a heatproof spatula until slightly thickened, about 1 minute. Whisk the hot milk mixture into the cream cheese mixture until smooth. Cover and place in the refrigerator until completely cool, several hours or overnight. Alternatively, place over a bowl full of ice cubes until thoroughly chilled before churning.